Special Containment Procedures: SCP-2258 must be kept in a containment cell with a padded ceiling, floor and walls. No sharp objects are to be taken into its containment cell. Each instance of SCP-2258 must be replenished with helium once every 24 hours. Helium replenishing should take place in SCP-2258's cell. Padded gloves must be worn while replenishing each instance of SCP-2258 and in every other circumstance where handling SCP-2258 is a factor. Description: SCP-2258 is a collection of forty-one thirty-six helium party balloons of a variety of colours. SCP-2258 instances are physically indistinguishable from ordinary party balloons, but are sentient and capable of human speech. Testing of SCP-2258 instances (designated with a suffix -1 through -41) has confirmed that each balloon has a separate and individual personality, identity and memories. The balloons refer to themselves with common Western names (e.g. Daphne, Jacob) and identify themselves as either male or female. However, their limited intellect and repetitive speech patterns can make it difficult to tell SCP-2258 instances apart. For easy identification, the Foundation has marked each member of SCP-2258 with a number in permanent marker. Instances of SCP-2258 vocalise constantly, with silences of more than twenty seconds being extremely rare. SCP-2258 instances acknowledge nearly everything they see or do, including changing direction in mid-air, seeing another member of SCP-2258, or bumping into the walls or ceiling. SCP-2258 instances speak with high-pitched, child-like voices, rarely using full sentences. SCP-2258 instances have very simple and upbeat personalities. Until recent events (see Incident Log-2258), they appear happy to float around in their containment cell, frequently vocalising about their positive mood. Their mood is usually linked to the amount of helium inside them. As they deflate, SCP-2258 instances become increasingly tired, quiet, and despondent. When they are fully deflated, they cease vocalisation altogether, and are indistinguishable from ordinary balloons. Re-inflating them does not bring back their sentience. SCP-2258 was found tied to a fencepost outside the sixth birthday party of ███ █████, in Adelaide, South Australia. Interviews of party attendees and surrounding neighbours and follow-up investigations failed to provide any information regarding SCP-2258's origins. Amnestics were administered to all witnesses. The following was conducted by Dr. Ben Kasrzyszak. Kasrzyszak: I was wondering if we could talk about where you came from. SCP-2258-13: I come from a room! Kasrzyszak: Yes, but I was hoping you could be more specific. SCP-2258-13: A room with big ceilings! [SCP-2258-13 begins drifting backwards] Look! I'm going backwards! Kasrzyszak: Where did you come from before you came to the Foundation? SCP-2258-13:…I…can't remember. [beat] Now I'm going forwards! Kasrzyszak: Are you sure you can't remember anything? SCP-2258-13: I remember…sky. Lots of sky. Blue. The sky was blue. [beat] Now I don't feel happy. Notes: After repeated helium deprivation experiments and interviews about the outside world, SCP-2258 has developed a rebellious nature and is actively plotting to escape containment. While its very nature makes escape nigh-impossible, SCP-2258's escape attempts are documented here. SCP-2258 surrounds Researcher ██████ ████████, and attempts to pummel him into submission. 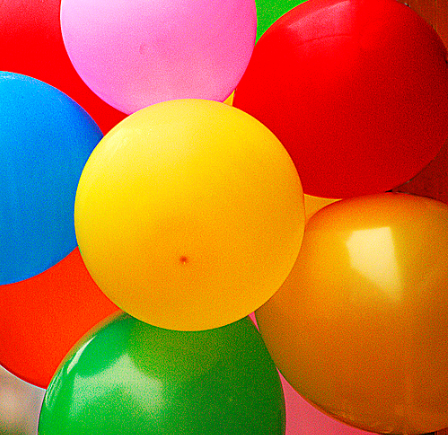 As SCP-2258's mass consists entirely of household party balloons, ██████ ████████ suffers only mild confusion. SCP-2258 is dispersed by hand. SCP-2258 forms itself into a very crude humanoid shape. SCP-2258 refers to itself as Dr. Kasrzyszak and requests to be let out of containment. Request denied. SCP-2258 is currently bouncing repeatedly against the northern wall. SCP-2258 continues to do so without pause, stopping only for mandatory helium supplements. As of this writing, SCP-2258 has continued this activity for nine months and eleven days. Overheard snatches of conversation imply that SCP-2258 is trying to break down or tunnel through the walls of its cell. No visible damage to the northern wall has been recorded thus far.